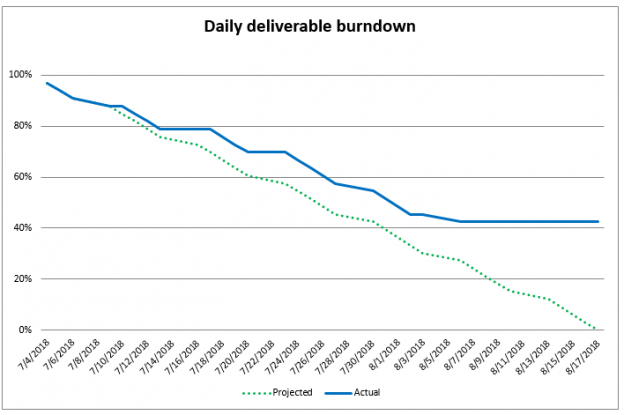 In the first article I wrote on how to create a SCRUM-based, sprint burn down in Excel, How to create an advanced sprint burn down chart in Excel, I showed how to easily set up a conventional burn-down with effort points as a percent, to create a pretty nice looking burn down chart, just by entering the IDs of each completed PBI on the date that it was finished. In this spreadsheet, though, we’ll look at another kind of sprint. Think of a goal to go to the gym for an hour every day, or to burn 500 calories a day, or to complete your daily deliverable task every day. In this spread sheet, we’ll track adherence to that goal, whether it is a variable amount like 400 or 450 calories or a Boolean, “yes” I completed my task today or “no” I didn’t. In the first case, we’ll set up a sprint where you commit yourself to go to the gym and burn off 500 calories a day on the elliptical machine. Now let’s look at a scenario where you simply want to track if you have done your daily deliverable or not. The unit would be “1”. Then each day, you would enter “1” if you did it and “0” if you didn’t.